Combining renowned German build quality with cutting-edge tech, Miele ovens look good and deliver superior performance in the kitchen. Miele’s premium appliances always showcase the latest innovations and its oven range is packed with clever features to make grilling, baking, roasting and steaming easier than ever. 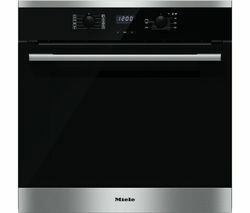 The Miele oven collection offers a selection of multifunction electric ovens, steam ovens and oven-and-microwaves combinations. Compact or large enough to feed the extended family, you can choose from a range of sizes and attractive steel and glass finishes. 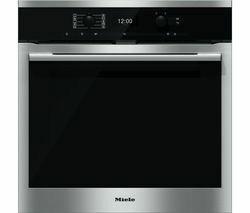 Miele ovens offer some unique features to make cooking easy, including its steam ovens’ Moisture Plus mode. Perfect baking and roasting can be achieved with just the right amount of moisture, making meat tender and baking the freshest bread and rolls. Miele’s unique air cooling system ensures that ovens are cooled on all sides. Multi-layer panels insulate the oven door to keep heat effectively locked inside while keeping the outer door, handles and knobs cool. This means greater safety around the home, ideal for households with small children. The AirClean Catalyser system helps to banish grease build up and nasty odours. It filters emerging steam from your cooking, for a cleaner, fresher kitchen with grease-free surfaces. Specialist functions mean you can do more with your oven, like proving dough and drying fruit. All models use electronic monitoring of the cooking temperature to guarantee precise temperature regulation. As well as perfect cooking results, Miele ovens also take all of the hassle out of oven cleaning. The pyrolytic cleaning function uses high temperatures to burn away grease and dirt from the inside of the oven, so you can wipe away anything that's left once the oven has cooled. PerfectClean trays resist soiling and are easier to keep clean and do away with the need to use baking parchment. For the latest tech offerings for your kitchen, take a look at our wide selection of ovens, including our cutting-edge Neff ovens and built-in double ovens ideal for larger households.